Almaden Minerals' Mexican gold-silver Ixtaca mine should be able to produce 168,100 toz of gold equivalent per year at an AISC of $862/toz. The initial CAPEX is estimated at $117 million, the after-tax NPV(5%) is $310 million. Conservative estimates show that shares of Almaden should be worth at least $2 after it gets into production. If everything goes well, first gold and silver should be produced in H2 2019. Almaden Minerals (NYSEMKT:AAU) has developed a very promising gold-silver project in Mexico. The Ixtaca gold-silver deposit contains 2.4 million toz gold and 138 million toz silver. The April PFS presented significantly improved economics of the project compared to the PEA. Shortly after the PFS was released, Almaden's share price grew by more than 50%. However, the initial enthusiasm has faded away, and the share price declined back to the pre-release levels. Right now, shares of the company that expects to start gold and silver production in 2019 present an interesting upside potential. 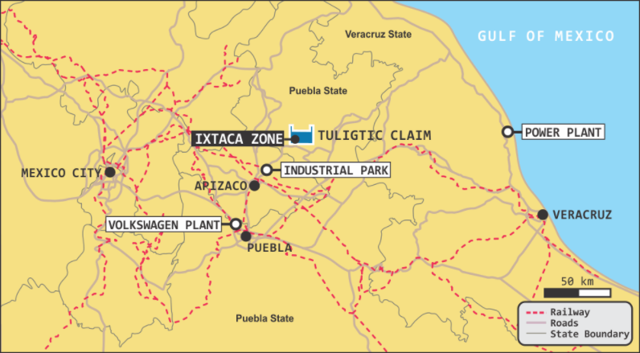 The Ixtaca deposit is located in southern Mexico, the Puebla State, approximately 100 kilometers to the east of Mexico City. 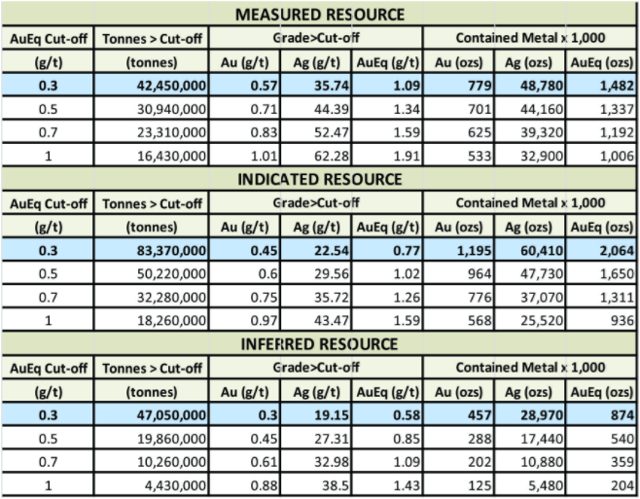 At a 0.3 g/t of gold equivalent cut-off grade, Ixtaca contains measured and indicated resources of 1.97 million toz gold and 109 million toz silver, or 3.55 million toz of gold equivalent, at a gold equivalent grade of 0.9 g/t. Further resources of 457,000 toz gold and 28.97 million toz silver (874,000 toz of gold equivalent) are included in the inferred category. Although the grades don't seem to be too impressive, the economics of the proposed mining operation is good, as it is close to the surface and it will be mined as an open pit mine. A significant part of the resources is included in reserves. According to the PFS, the proven and probable reserves contain 1.29 million toz gold (0.62 g/t) and 78.83 million toz silver (37.7 g/t). It equals to 2.43 million toz of gold equivalent at a gold equivalent grade of 1.17 g/t. The proposed mine should produce 88,780 toz gold and 5.47 million toz silver (168,100 toz of gold equivalent or 11.6 million toz of silver equivalent) per year on average over the first 9 years of the 14-year mine life. However, there's a good probability that the mine life will be expanded, as according to the recent drill results, the deposit is still open to the north and at depth. The mine will start as a 7,650 tpd operation, expanding to 15,300 tpd by year 5. A contractor will be used to mine the deposit, which should help to decrease the CAPEX, however, it will also lead to higher OPEX. The AISC is expected at $862/toz of gold equivalent or $12.5/toz of silver equivalent. Besides the sustaining CAPEX, the AISC numbers presented by the PFS include also the expansion CAPEX of $72.11 million that should help to grow the operation from 7,650 to 15,300 tpd. Although the AISC seems to be relatively high, it is important to realize that most of the companies deduct the by-product credits from their AISC numbers. However, as the value of the gold and silver contained in the Ixtaca deposit is almost equal, Almaden doesn't consider any of the two precious metals as by-products. This is why the resulting AISC is higher; however, it applies to gold equivalent (or silver equivalent) ounces, not only to the pure gold or silver ounces. As can be seen on the map above, the project is located in the heart of Mexico, close to the capital Mexico City. There is good infrastructure in the region, which helps to push the estimated CAPEX lower. Other important costs were saved by Almaden's management that was able to purchase an almost unused mill back in 2015. The Rock Creek Mill was commissioned in September 2008; however, due to the global financial crisis, its operations were suspended in November 2008. It has been kept under care and maintenance ever since. Almaden was able to purchase the 7,000 tpd mill and related equipment for only $6.5 million and 407,997 common shares. This transaction helped to cut the CAPEX significantly. As a result, the initial CAPEX is estimated at $117 million, which is a very reasonable price. The current market value of Almaden Minerals is $110 million and the enterprise value is $90 million, as the company has cash of $20 million and no debt. There are also some options and warrants that could push the number of outstanding shares from 99.9 million to 117 million if fully converted. 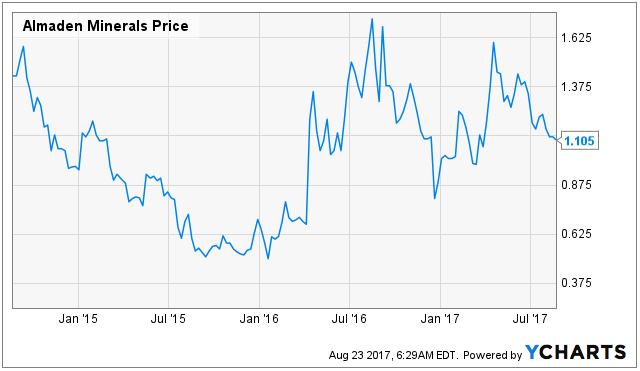 The enterprise value of Almaden Minerals is very low compared to the projected after-tax NPV(5%) of $310 million (using a gold price of $1,250/toz and a silver price of $18/toz). As the initial CAPEX is only $117 million, Almaden should be able to finance it without any trouble. As the recent history has shown, projects with worse economics and located in worse jurisdictions were able to secure debt financing for 70-80% of their CAPEX needs, even at worse precious metals market conditions. In March of 2015, Red Eagle Mining (OTCQX:RDEMF) secured a credit facility worth $60 million to finance its Colombian San Ramon gold mine. According to San Ramon's feasibility study, the average annual production was estimated at 48,500 toz gold, at an AISC of $758/toz. The after-tax NPV(5%) was only $108 million, even at a gold price of $1,300/toz. But it didn't discourage Orion Mine Finance from providing a loan worth 80% of the estimated CAPEX. A similar success was reached by Hummingbird Resources (OTCPK:HUMRF) in December 2016. It secured a debt financingworth $55 million for its gold mine with a projected average annual production of 107,000 toz gold, at an AISC of $695/toz. The after-tax NPV(8%) was $162 million, using a gold price of $1,250/toz. Although the project is located in Mali, Taurus Funds Management was willing to finance almost 70% of the projected CAPEX.